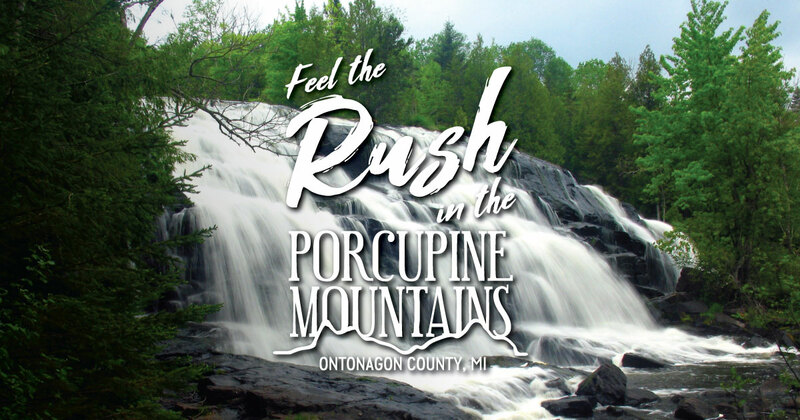 One of the most rewarding ways to explore the Porcupine Mountains and Ontonagon County is also one of the simplest. The region receives more than 200 inches of snow annually, and the forest is wild and gorgeous. Snowshoes allow adventurous visitors to take in all this beauty one step at a time. Here are three trails to explore. There are a lot of great snowshoeing options in the forest surrounding the Porcupine Mountains Ski Area. The trails are groomed for cross-country skiing, but snowshoers are welcome to use the same paths—just stay to the side of the groomed portion to avoid disturbing the ski trail. Loops of various lengths are possible via the Nonesuch Trail, Big Hemlock Trail, Union Spring Trail, Log Camp Trail and Deer Yard Trail. These trails will give you a nice taste of the wilderness and the features that make this place special; for example, the Union Springs Trail passes Michigan’s second-largest natural spring. The Big Hemlock Trail offers outstanding winter views of Lake Superior. M-107 (also known as 107th Engineers Memorial Highway) is the road that takes you to arguably the most iconic site in the Porcupine Mountains—Lake of the Clouds. The access road isn’t plowed in the winter, but don’t worry, you can still explore this great attraction. A snowmobile route goes to the lookout; snowshoers can follow the same route, trekking next to the snowmobile trail. The trek includes a serious climb, but the unforgettable view at the top is well worth the effort. The beautiful thing about snowshoeing is you don’t need a well-groomed trail. The Porcupine Mountains Wilderness State Park is a 60,000-acre swath of waterfalls and forest that beckons explorers. Use caution when venturing into the forest—this is a vast place and winter conditions can make navigation challenging. But with caution, adventurous snowshoers can see some incredible sights. One option—just west of the Porcupine Mountains Ski Area, trekkers can discover a beautiful tract of old growth forest.